MusicOntario during the Pan Am Games feat. Basia Lyjak & Geoff Willingham! 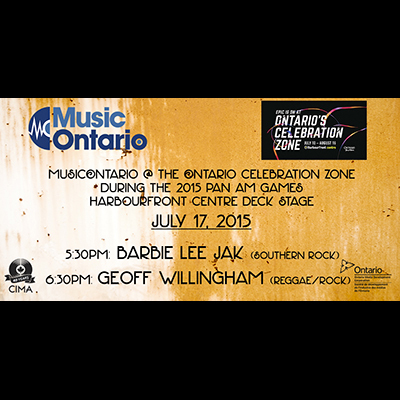 MusicOntario is taking on the Ontario Celebration Zone's Harbourfront Centre Deck Stage for 10 days during the 2015 Pan Am Games in Toronto! Check us out 5:30-7:30PM each Thursday, Friday, Saturday and Sunday from July 11-26! July 17th brings you... BARBIE LEE JAK (AKA BASIA LYJAK) - 5:30PM 15 years into her career, Basia Lyjak is a woman in control; she is a veritable supernova of songwriting and vocal talent poised to explode, putting a stranglehold on her eager existing fans and caught-off-guard new converts alike, leaving them rapt and thirsty for more, more, more! A chameleon songwriter, Basia’s career has woven itself across many genres over the years; she’s been in pop bands, on club tracks and metal cuts, and has long filled the role of fearless rock n’ roll frontwoman in her solo projects. She has released two EPs and five singles and has a slew of rock and southern-fried gems recorded and in the bank, which is where the story arc changes for Basia. After a stint in Nashville for a songwriting clinic with the Flanders family, Basia found herself with a new perspective on writing structures and how far simplicity could go when crafting melodies and lyrics. 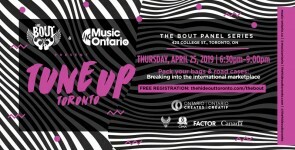 Having arrived in Nashville in a bit of a personal funk, with a handful of recently written songs she was unsure where to place stylistically, a reinvigorated Basia landed back in YYZ inspired and pointed in a new trajectory. 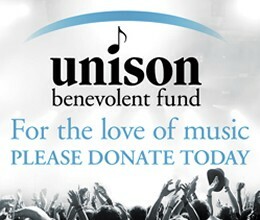 Enlisting long-time guitar player Ron Bechard (Crash Karma, Edwin) to guide musical direction during production, Basia set about recording the four new tracks with Tennessee as her muse; a blend of old-school country with a heavy edge that she and her Taylor acoustic hashed out, just the two of them. She’s dubbed it Southern Fried Rock – a genre all her own. The project, Barbie Lee Jak, takes flight in 2015, the sonic secret child of Hank 3, Gretchen Wilson and Chris Cornell. Of course, when it rains, it pours, and in the midst of plotting the launch of Barbie Lee Jak, Basia got a call to audition for St. Catharines-based rockers Step Echo – a heavy band with some serious roots, then in search of a new singer. Intrigued by the challenge, Basia hit the books and studied the catalogue she’d be power belting out – a collection of songs that, to her surprise, all featured a male vocal. A jam was scheduled shortly thereafter, and all parties left knowing something special had happened: the chemistry was undeniable, and Basia was offered the gig before she even got home from the audition. After years of tug-of-war – country or rock? – Basia is finally doing what she sneakingly suspected she could do the whole time: all of it! With their debut gig on July 31 at Canal Days in Port Colborne (with I Mother Earth and Junkhouse), the new incarnation of Step Echo hits the studio this summer, and fans can expect cameos of the heaviest from Basia’s rock n’ roll catalogue in live sets. Most notably, don’t be surprised to hear her collaboration with Yurko Mychaluk (Klooch, Nelly Furtado): "Sick N' Tired," a feisty, hooky track that takes the grit and attitude of Canadian superstars like Three Days Grace and Finger 11 and puts a heavy, ballsy female rock vocal over it, proving that Basia has never had a problem keeping up with the boys! 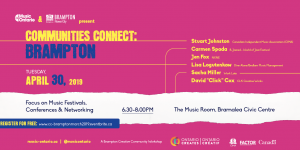 On the Barbie Lee Jak front, you can get a shot of southern twang this summer on July 17 at the Ontario Celebration Zone Harbourfront Deck Stage during the 2015 Pan Am Games in Toronto, with more dates to come! "I'm proud of where I've been and excited about where I'm going," Basia declares, smiling, referring to her past releases - her debut EP, 'Basia Lyjak' (2002), her sophomore EP 'Writings on the Wall" (2007), and three stand alone singles, 'Don't Talk,' 'What It Feels Like,' 'Never Wanted Anything,' and the radio-charting Sunshine. If these first few flourishes of colour in the aural kaleidoscope that is her arsenal of songs are any indication, Basia has no shortage of music to share with the world, genre be damned. So, what are you waiting for?! Stop missing out and hear what all the fuss is about for yourself @ www.barbieleejak.com & www.stepecho.com! (Photo by Ron Boudreau) GEOFF WILLINGHAM - 6:30PM Hailing from Toronto, Ontario, Geoff Willingham aka “Geoff Star” has been the lead guitarist for acts that span the musical spectrum from rock to reggae, ska and hip hop. With undeniable energy and passion for music, Geoff has been touring non-stop since starting his professional career at 15. 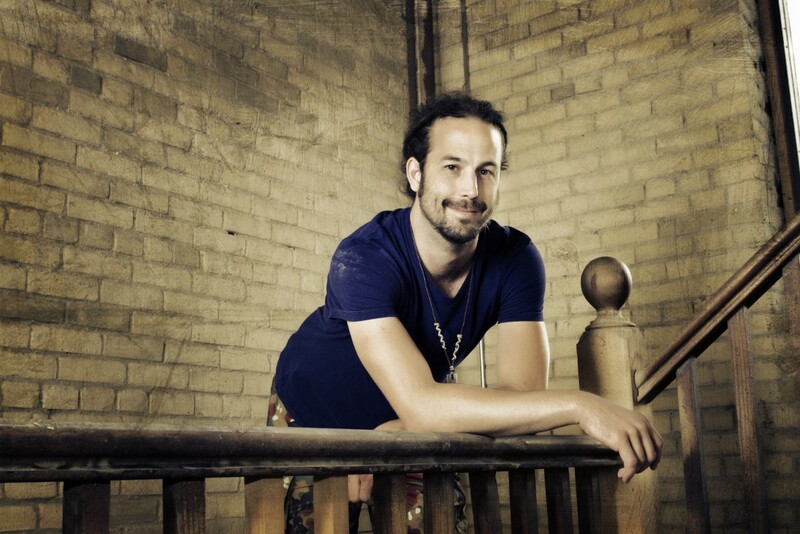 Geoff is currently touring with Juno award-winning artist Jully Black and Gold selling artist Ill Scarlett. Geoff is also featured as one half of the house band on the Todd Shapiro Show (Sirius XM channel 168, 4-6pm, Monday to Friday), a daily live talk show featuring one of Canada's most hilarious, original and beloved radio personalities. Geoff provides musical direction and using his vast musical repertoire contributes to the flow and energy of the broadcast.